It has never been a question of how fast you can improve or how good you’re going to get. The ultimate truth is that you will improve, and you will become better and better in that infamous sport called basketball. How? There are a lot of ways, but one foolproof plan is to start learning its fundamentals. For both coaches and players, there are a lot of hard-court actions that need to be handled with the appropriate approaches. And this is one of the avenues where our basketball fundamentals know-how will come in handy. Coaches all over the globe spend a large portion of their training courses and drills on these fundamentals for this very reason. As an example, you might once in a while find yourself facing opponents with different tactics, or handling coaches with different coaching styles, or playing with team mates with different techniques and attitudes. Now, how do learning basketball fundamentals help in handling these scenarios? Simple. It makes your adjusting and relating with them quite easy. For instance, if you already have the background on shooting, dribbling and ball handling fundamentals, you should be able to adjust to your team’s or coach’s or even opponents’ game tactics with relative ease, no matter how many of them you face every so often. Let’s face it. For most people, basketball is a serious business. That’s why others would go through great lengths to study their opposing team’s moves and strategies in both offense and defense. If you find yourself as the one being under close observation, a solid background on basketball fundamentals will do you a lot of good. With these fundamentals, you and your team can always switch to from one tactic to another, based on the strengths of each member. Try to experiment with the basketball drills in your practices; dare to try something new but be consistent in executing them properly and excellently. So that even if opposing teams pay a close attention to your offensive and defensive moves, you will still have the upper hand in giving them an element of surprise. The same goes to the one observing the opponents. After analyzing their moves, you should be able to use your knowledge of these fundamentals to come up with a counter move offensively and defensively, to your opponent’s surprise. From beginning basketball players to the most seasoned ones, all will benefit a great deal from learning the fundamentals of the game. These fundamentals play a significant role in a player’s development from one skills level to another. And this progression is especially helpful in the different competition levels – from recreational youth leagues to semi-professional (e.g. NCAA) to professional basketball (e.g. NBA) – as each of these levels demand more and more out of both players and coaches. To illustrate, note the various fundamentals of basketball (e.g. dribbling and ball handling, shooting, passing, rebounding, free throwing, and lay-upping). While the basic concepts remain the same, the intensity and pace undoubtedly changes as one progresses to a higher skills and competition level. We can’t expect a player to use the very same shooting techniques he learned in junior high when he starts to play in collegiate basketball, can we? And if he does, then we can bet that he has added a twist or two in it in order to be on the same footing as everyone else in his level. The fact is that the higher the level of competition gets, the higher the level of skills will also become, and knowledge on the fundamentals of the game will be a big advantage. In most cases, great things start from small beginnings. The same thing can be said with basketball. 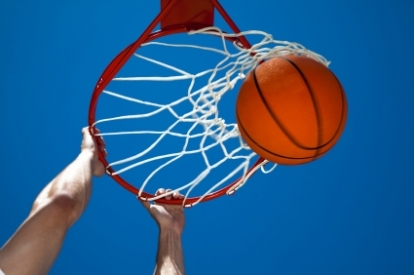 You will find that learning the fundamentals of basketball can be your loyal company on the way to basketball stardom. If you’re a good coach, we need not advise that you work on these fundamentals in every practice. And if you’re a good player, we need not remind you to learn them. They are, in the first place, what make us good in the sport. and patience to master them all, but if and once you do, you can say hello to a promising career in basketball.